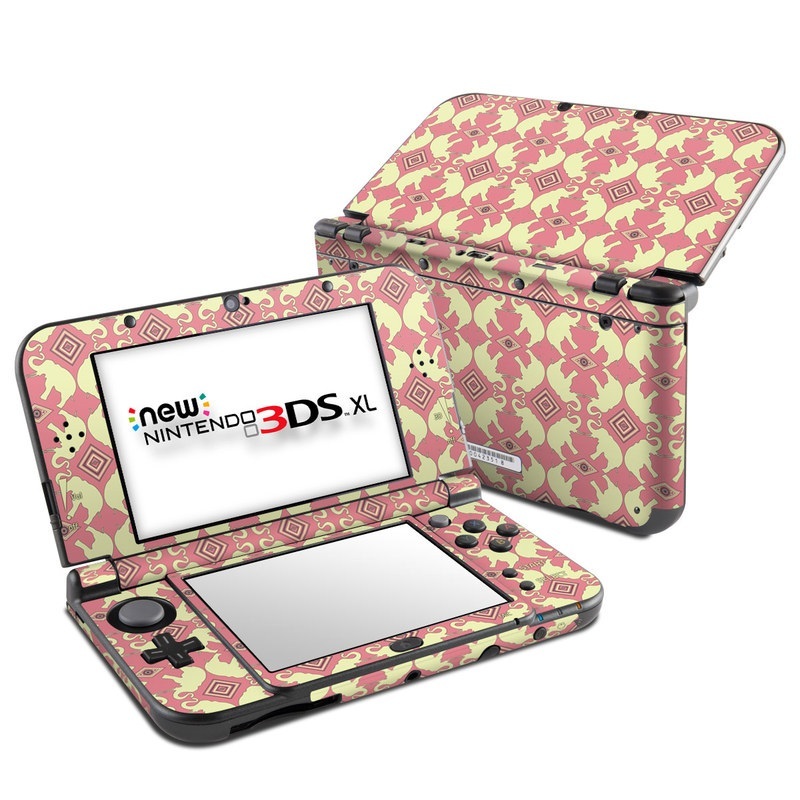 This skin fits the New 3DS XL (released early 2015). To get this design on the older 3DS XL, click here. Features unique artwork by Rachelle Lane. Remember, we offer over 1000 pieces of art as skins for your Nintendo New 3DS XL. I love it! I'm a huge Zelda fan, and I believe this looks great on my New 3DS XL! 10 of 13 people found this helpful. Such a great skin, as green is my favourite color! Awesome! Perfect fit with my 3DS. I Love this item. Awesome way to customize a game system! My skin was gorgeous and exactly how I wanted it to be. I'm so glad I chose the matte finish, which feels great and looks nice. To me, the skin was easy to apply. Advice for buyers is to take the skin off the sheet slowly so as not to stretch the more delicate parts and take it slow applying it to your clean 3DS and you'll be fine. My only complaint, and it is a minor one at that, is that the holes cut for the AB/XY buttons are just the tiniest fraction too snug and makes the buttons slightly harder to press. So far it doesn't seem to hinder my gameplay, but it might bother me with a more button intensive game. Other than that, the skin is fantastic! This is, by far, the coolest skin I have ever purchased! I receive compliments all the time abut how awesome this skin is. It was a bit tricky to put the top part on the screen, but I was eventually able to install it. Note that you will have to trim any screen protectors if you intend to add them to the top, however! This is a very colorful skin, and was easy to apply to my new 3DS. If you like nautical things? you'll definitely like this! I thought that the decal looked great and most of it was really easy to put on! My only problem was that the upper screen has a large wrinkle because it is very difficult putting that piece on. If anything, I would recommend finding a way to make putting the decal on the upper screen easier and possibly have separate pieces for the top screen so you are less likely to end up with wrinkles. Great pattern. Much more eye catching than the original black. I wish it could cover more of the corners as some is left a little more bare than I would like. I need to break this into a 2 part review. 1 on the artwork and 1 on the skin sizing itself. The artwork is amazing. Love how it looks on my New 3DS XL. I'm assuming it's a dragon skull and I love dragons. The other artwork by Kerem is also amazing, but I chose this piece of work since it felt more fitting for the device. Other pieces of work, while really nice, wouldn't look that great on the 3DS, in my opinion. Now onto the skin itself. This has nothing to do with Kerem's work, but more on DecalGirl's skin measurements. It feels rushed. While it's my 1st time ever buying a skin, I felt like I applied it properly. However, it has some issues. Mainly, the inside top skin, the one around the top screen. I tried to line up the holes for the speakers on either side at the same time. Ran into issues, so I removed it and tried again. This time, I allied it perfectly to the cameras. Then I realized the DecalGirl measurement issue. The speaker holes aren't cut in the correct spots. Wondering if this is why other skin sites haven't released New 3DS XL skins yet. Looks amazing and easy to install. On the original 3DS XL the skin was tricky around the bottom of the screen but on the new one, no such issues. I used only the outside set of stickers to avoid distrcting myself while playing games, but it still looks amazing on my black N3DSXL! I get lots and lots of compliments from people who don't even play games. It just looks that good. Matte is the way to go with portable electronics; looks just as good without putting glare onto other people or attracting TOO much attention. OH MY GOD. Stunning skin, simply stunning. Better than any cover licensed by Nintendo. It's really pretty; and shipping was quick, a little over a week. I designed it after the Gen. 1 Pokedex and it came out near perfect! My only issue is the design on the back is a bit grainy but it isn't too bad. Just a minor gripe I'll be sure to buy from here again! It's perfect, quality is great, shipping fast and very well done, I'll consider buying here again !! It looks just as nice as I hoped it would. I'm usually really bad at applying decal stickers, but I didn't have much trouble with this skin. It was easy to keep trying until I got it even, and it didn't take many tries. I chose the matte option. It feels soft and doesn't seem to pick up fingerprints. Bought this for my husband; he loves it. Gorgeous colors, I get compliments all the time. Love the details of this skin! It is beautiful! Crisp design and great for little ones! I LOOKS AMAZING! THIS SKIN IS BAE! While this skin looks absolutely outstanding, like other eevoews say, the top screen piece is quite difficult to get right. This site needs to re-make this design, with appropriate measurements. Other than that, the skin is very good! The design is great and it was exactly what I expected. Easy to use, great result. My son has this one on his New 3DS XL......he thinks it is really cool! Pretty easy to apply. Keeps my 3DS from getting scratched. Beautiful artwork. Really looks good on my console! So cute, it fits perfectly on my black new 3ds xl. Love it! Only peeve is that the sticker that goes on the hinge only covered half of the visible hinge and left too much off a black area when device is opened. Other that that it was beautiful and practical enough to apply by ones' self. Love it really easy to apply and looks great. Not only did this come in the mail super fast but it was pretty easy to put on and even when it got a little difficult I was able to gently peel it off and reapply it with no problems at all. I had not one air bubble problem and am over all really impressed with the quality of this skin! The colors are bright and vibrant and it covers almost the entire 3ds! I will definitely be buying from decalgirl again! This is an awesome designed skin! It covers both the top, bottom, the inside, and some tricky areas with the hinge and rear. Out of all the devices I bought a skin to cover, this is the best. It was not very difficult to apply, and it looks awesome afterwards! It's a bit tedious to install, but the final look is great on a grey New 3DS XL. This is an amazing skin I love it. When I buy it, I would write my name on it with sharpie. An excellent skin, DecalGirl makes very high quality vinyls! Was skeptical at first, but this skin came in exactly as I had created it. Even better, the image quality was outstanding. The material is very durable and scratch resistant. Although putting the skin on is not the easiest, if you mess up it peels off easily and can be adjusted. Will definitely order again! I got this all the way from Australia, taking about 3 weeks (15 business days) to get here. It was well worth the wait, I say! It took a bit to apply correctly, and a couple bits are slightly off, but overall it has a nice, smooth appearance, as well as a natural feel (Matte/Satin, which I highly recommend) as if it was always meant to be part of the system. Where has this been all my life...? I've just recently started to put music on to my New 3DS XL and I do this quite often and many of you may already know getting to the micro SD card is a NIGHTMARE in these consoles and all though I may not have too much of a problem with it what I started to notice is that every once in a while when the screwdriver slips while unscrewing the screws it was starting to leave scratches behind. However, that wasn't the end of my problems with the console prior to putting on my skin. I personally never really had a problem with the slickness of the New 3DS XL most likely because I've been holding DS systems since I was 7 back when they had a more solid plastic material for both face plates but whenever I handed it off to any of my friends the first thing almost all of them said was "It keeps slipping out of my hands." whenever they played. Yet another minor detail was that I also started to notice the paint covering the two supporting stubs that held up the hinge were started to peel off in quite a few areas. Obviously the paint problem is no longer a problem along with the bottom face plate being mildly severed and the sticker definitely adds a very enhanced grip to the console which I even noticed myself. I highly recommend this website for skinning anything your heart desires not only for design but also for the purposes of something much like a protective snake skin for any console. The Webslinger skin looks awesome on my New 3DS XL. Only tiny nitpick is that it feels kind of slippery when brand new. Are you looking for a awesome skin to put on? This one is perfect! TwT Player on the back is a YouTube Channel, the creator. This skin is to show your a fan! It's pretty hard to do the border around the bottom screen but it looks great on my Red 3DS XL. With reference to my other review I had written for the Her Abstraction design for my new 3DS XL, the only issue I have is the cutting - it is ALMOST there, but not perfect accuracy. However, I still recommend their skins for their beautiful designs and premium quality. Absolutely in love with the quality and premium feel of their skins. The only issue I have is the cutting - it isn't 100% accurate. Some of the cut outs for the ports are not exactly aligned. It covers the led lights slightly, and the power button cut out too is not perfectly around it even after several adjustments. Despite so, I still recommend their skins for their beautiful designs and premium quality. I've been buying from DecalGirl for years and I always find their skins to be great quality. Fits nicely, fast shipping, love the matte finish! Seems good from what I can tell. Very, very classy skin. Purchased in high gloss finish, it honestly looks incredibly elegant. I would definitely suggest this skin for anyone looking for something out of the norm for gamers, geeks and nerds. This skin is phenomenal! I purchased it in matte finish, but I would highly suggest the high gloss simply because the gloss makes colors pop and this skin is just chuck full of colors. It is the fourth skin I've purchased from this site and by far one of the prettiest. Like most of these skins, the fit is very, very slightly off. Thankfully, with careful placement, you only notice if you are actively looking for defects. The skin fits perfectly and looks amazing on the red New 3DS XL. Ordered November 28th, recieved December 7th. I've got a red new 3ds XL, and ordered a matte finish of this design. The quality of the skin is amazing, feels very professional and I don't feel like it will peel very easily. Application was super easy, and even though i made a few mistakes, it was simple enough to gently peel off the areas and redo them without causing any harm. I love the design and I'll probably spend more time looking at the outside than the inside now. Will definitely check out other products. The design is gorgeous and the skin fits perfectly on my New 3DS XL. 100% recommended. Just like the rest of the skins found on this site, the process of applying the skin to the system was easy. They also give you a sense of protection from little things like scratches and nicks. I'm sure there are a lot of people who buy skins for that very reason, but I get the for the aesthetics, so the sense of safety of the device comes as a bonus for me. AWESOME ! I will order again for sure. Just received my skin. Easiest application ever. So so happy with it. Great custom skin! The fit was perfect. The skin is so smooth and easy to apply. The reason I gave 4 stars instead of 5 is because I chose the matte finish and it is not as vibrant and bright as the picture would lead you to think. I don't mind though, because there won't be the glare to deal with which hurts my eyes. The skin makes the 3DS XL much easier to grip. I have made my own custom skins for my PlayStation 4 and now my Nintendo 3ds XL. I love how crisp my photo art comes out and how easy it is to apply the skin. It's durable and typically I have no air bubble issues. I have ordered both high gloss and matte skins. I prefer matte for better grip on controllers however if you're looking for the best style and grip isn't an issue, high gloss is a beautiful finish for any design. This has been Sk8 Boy Q from Twisted Saiyan Gaming and Entertainment. I hope that you love your skins or custom creations as well as I love mines. Bought it as a gift for an 11-year old girl, would definitely recommend it. This is such a neat decal, and it even though it took a bit of time to apply it, it was easy and well worth the effort! I love the texture of the matte vinyl, and it just makes my N3DS feel like I can hold it, rather than feel like it'll slip right through my hands while holding it. I am also very impressed that it is one of the few kinds of skins I've ever come across to cover most of the console, rather than just a few select parts. It allows you to remove the screws on the back with the skin still on, as well! I absolutely love this skin and this website, and I can't recommend either enough! Very pretty and feels nice. Enough to ignore the couple minor nitpicks. The frames around the screens were a little tricky. Perhaps would have been better in two parts per screen, and had to pop out the holes for the speakers after peeling from the backing. Also the thin edge of the upper section of the console would not hurt to be covered too. Again though, just minor niggles, and barely detract from something that on the whole is a big improvement. Tell Us Why (Optional) Nice design. Quality is good and feels great in the hand. This skin was very easy to install and everything lined up perfectly when I was done. Very creative concept! The only tricky part is getting the small bezel piece around the touch screen to keep the "blue line" pattern straight, but the final effect is well worth the effort! is awsome in my red new 3ds xl!!!! Exactly as advertised! My custom 3DS XL skin is beautiful. The graphics came out sharp and clear, and installation was easy (if you're very careful!). The matte finish was definitely a good choice. this skin looks amazing! love it! Difficult to install on 3DS, though of no fault to the maker. Looks good, but sadly would have been better on a black 3DS. this skin make your 3ds look valuable. Retro and cool,I love it! Love the look.. the finish. Fits perfectly and with the base color of the system coordinating its an eyecatcher yor all to.envy!